According to Kathleen Karlsen of Living Arts Originals, the use of flowers as symbols for human characteristics began in ancient times. Flowers and plants were often associated with a god or goddess, and during the Renaissance it became the practice for artists to add these plants to their paintings to symbolize the characteristics attributed to a particular deity. During the Victorian era, the idea of using "the language of the flowers" to express one's feelings became very popular, and this practice is still in use today. Heather flowers symbolize a change from the mundane to the extraordinary. The Scarlet Pimpernel (Anagallis arvensis) is a tiny wildflower of the lily family. It symbolizes change, particularly a major life change. 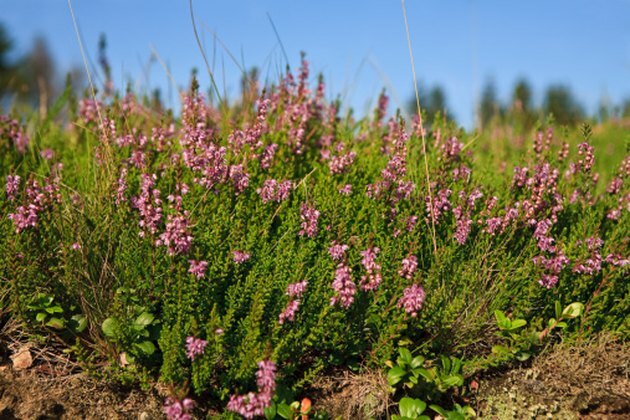 Heather (any plant from the family Ericaceae) is a sturdy flowering shrub that is covered with feathery lavender or white bloom in the spring. Heather symbolizes transformative change, or something growing from the mundane to the extraordinary. The lilac (Syringa vulgaris), which is an early flowering spring shrub, symbolizes growth. It stands for the change from ignorance to knowledge, from innocence to wisdom. True black roses do not exist in nature, but common roses are sometimes dyed or painted black. A black rose is symbolic of death, particularly the death of old habits, and rebirth into a changed life or state of mind. The common daffodil (Narcissus sylvestrus) is one of the first flowers to bloom in the spring, often poking its green shoots through the snow. It symbolizes the change of seasons, the triumph of new hope over despair. Delphinium are tall, blue spikes of bloom from the family Ranunculae. In the language of flowers, they symbolize spiritual growth and change. Iris (genus Iridaceae) symbolize the change from the dreary monotony of winter to the showny rebirth of spring and the renewal of the earth. Snapdragons (Antirrhinum) convey the wish that all of the recipient's hoped-for changes will come to pass.